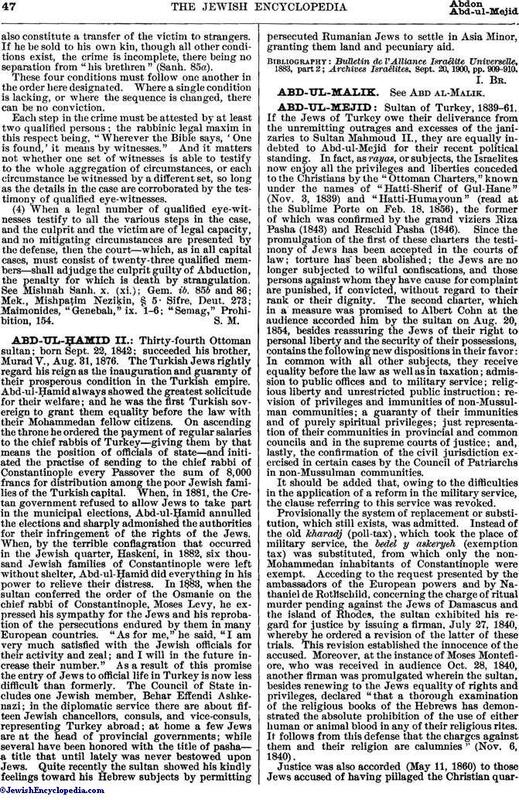 (1) To be amenable to the law for the crime of Abduction the malefactor, like the perpetrator of any other crime, must be a person—man or woman—of the legal age of responsibility, and of sound mental condition; and since the Hebrew commonwealth was based on the principles of national unity and equality, the Israelite, the Levite and the priest, the free-born and the slave, were alike answerable for the crime. Even the high priest could be called upon by a competent tribunal of seventy-five judges to defend himself in case of his infraction of the laws; and, down to the change of dynasties in the Maccabean epoch, royalty itself was subject to the judiciary (see S. Mendelsohn, "Criminal Jurisprudence," §§ 38, 45-50). (2) The victim of the crime must be a person, male or female, child or adult, who is free-born or made free. If the victim be a slave, or even "half a slave"—which might happen in the case of a person formerly owned by two partners, but emancipated by one of them (Giṭ. 42a)—no conviction for Abduction can follow, since, in the eyes of rabbinic law, "the slave has no brotherhood" ( —Sanh. 86a), and, consequently, there is no "stealing any of his brethren of the children of Israel." Nor is the offender, if found guilty of stealing such a being, obliged to pay the double fine which the Bible (Ex. xxii. 3) imposes upon convicted thieves; the slave, in Talmudic law, being placed in the same category with immovable property which can not be taken away by theft (Mishnah, B. M. iv. 9, Gem. ib. 56b). (3) To constitute the crime itself there must be (a) actual Abduction of the victim, (b) detention by the criminal, (c) enslavement, and (d) selling. (a) The Abduction must be complete; the victim must be removed from his home and from his family. If the victim be subjected to all the indignities forming constituent parts of the crime, while he still remains on his own premises the perpetrator of the indignities can not be convicted of Abduction. Also, where the victim is naturally or habitually under the offender's care—as when the victim is the offender's child, or ward, or pupil—the law will not convict of Abduction; for the law (Ex. xxi. 16) says, "If he be found in his hand," and thereon Talmudic law bases the conclusion that the words "If he be found" exclude him who is habitually found there, that is, in the offender's power (Sanh. 86a). (b) Detention as a constituent of Abduction must actually take place on the abductor's premises. If the victim be detained anywhere else, though by and under the abductor's authority, the condition is not fulfilled: "And he [the abducted] had been found in his [the abductor's] hand," which means within the abductor's own domains. (c) Enslavement must be accompanied by consciousness on the part of the victim. Hence, if the victim be in a state of unconsciousness—as in a profound sleep—at the inception of the crime, and remain in such state throughout the process of the crime and until its accomplishment, the crime is incomplete; there being in the eyes of the law no actual enslavement, since there could be no coercion at any stage of the whole procedure. If, however, the victim awake before he is sold, even though he has failed to realize his degradation up to the last act, the condition will be considered as fully complied with and the crime as complete (Maimonides, "Genebah," ix. 2 et seq.). To constitute enslavement the service imposed may be trivial. Thus, when the offender merely leans on the victim, or uses him as a screen against a draft, and that even while the subject is asleep, it will be sufficient evidence of enslavement. (d) By selling him the Talmud implies the sale of the victim as bondmen are sold (Lev. xxv. 42); that is, the whole person is conveyed. Therefore, if the victim be a pregnant woman, and be sold with the stipulation that only her prospective offspring shall become the property of her purchaser—although rabbinic law considers the embryo as part of its mother ( —Sanh. 80b)—this will not constitute selling in the meaning of the law. Nor does the sale of part of the victim's person complete the crime. Thus, if he be sold with the proviso that he be half a slave only (that half of his time shall belong to his purchaser, and he shall be free to dispose of the other half at his own pleasure), even this will not constitute the selling required in Abduction; for, from the Biblical expression, "or selleth him," the rabbis deduce the legal maxim, "If he sell him, but not half of him" (Mek., Mishpaṭim Neziḳin, § 5). The sale mustalso constitute a transfer of the victim to strangers. If he be sold to his own kin, though all other conditions exist, the crime is incomplete, there being no separation from "his brethren" (Sanh. 85a). These four conditions must follow one another in the order here designated. Where a single condition is lacking, or where the sequence is changed, there can be no conviction. Each step in the crime must be attested by at least two qualified persons; the rabbinic legal maxim in this respect being, "Wherever the Bible says, 'One is found,' it means by witnesses." And it matters not whether one set of witnesses is able to testify to the whole aggregation of circumstances, or each circumstance be witnessed by a different set, so long as the details in the case are corroborated by the testimony of qualified eye-witnesses. 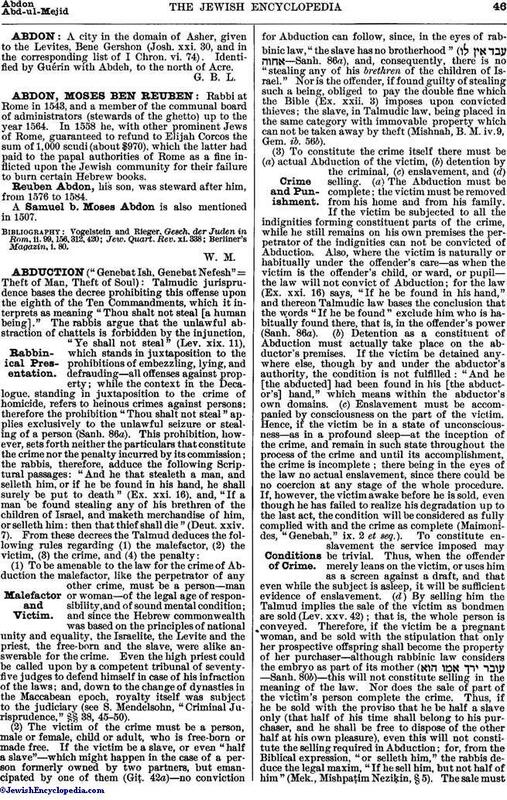 (4) When a legal number of qualified eye-witnesses testify to all the various steps in the case, and the culprit and the victim are of legal capacity, and no mitigating circumstances are presented by the defense, then the court—which, as in all capital cases, must consist of twenty-three qualified members—shall adjudge the culprit guilty of Abduction, the penalty for which is death by strangulation. See Mishnah Sanh. x. (xi. ); Gem. ib. 85b and 86; Mek., Mishpaṭim Neziḳin, § 5 Sifre, Deut. 273; Maimonides, "Genebah," ix. 1-6; "Semag," Prohibition, 154. S. M.